Leikkaan kortit : More ribbons! Hauskaa lauantaita, tervetuloa viikon Allsorts haasteen pariin! Nauhoja ja enemmän nauhoja aiheena. Malliksi tein keppihevostytölle muistikirjan, johon sain paljon nauhanpätkiä pois! Hi; Happy Saturday, it's time for a new Allsorts Challenge!" Ribbons, not only a bow!" is DT Wendy's theme. My sample is a gift, notebook for a hobbyhorse girl (very popular hobby here). I used a lot of draft ribbons and a colourful butterflies ribbon. Image is a digi, coloured with Promarkers. Girl's name is on the Gummiapan's fishtail diecuts, papers are Basic Grey's. A tag inside with Marianne design horse. 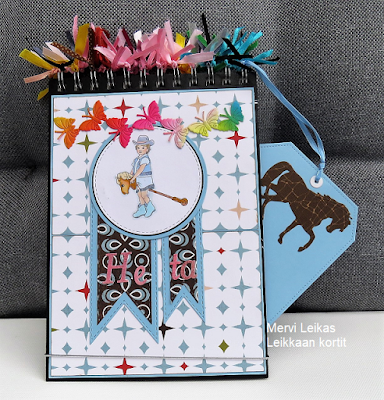 A great take on the theme Mervi and a pretty notepad and tag. What a fun notebook cover Mervi. Love all the pretty ribbons and the image is so cute too! Fabulous use of the ribbons a brilliant creation. 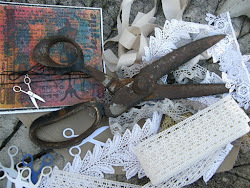 A fabulous way to embellish with ribbons, love your creation.